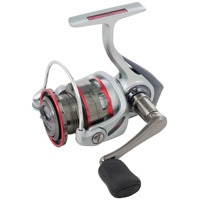 The next generation of Orra (TM S) spinning reels exemplifies sleek reel design and performance in a compact package. An aluminium reinforced C6 carbon body design seamlessly combines the X-craftic gearbox with a C6 carbon body. 6 stainless steel HPCR (TM) bearings + 1 roller bearing provide increased corrosion protection while maintaining smooth and consistent operation.  Machined aluminium braid-ready spool allows braid to be tied directly to the spool without any slip.